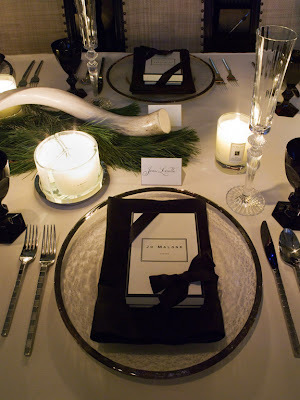 Hosting a holiday dinner party? Here are a few pics to get you inspired. 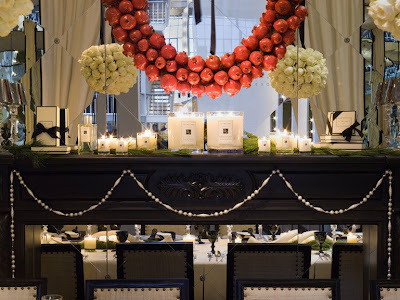 This table was created for the San Francisco Dining by Design event by interior designer Jean Larette in collaboration with Jo Malone London, a fragrance and lifestyle brand. Larette was inspired by Malone's cream and black packaging and clean, crisp lines. 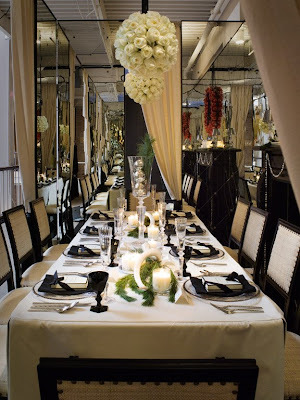 I like the use of the mirrors around the room which Larette said she used "to reflect that sparkle and enhance the intimacy of the dining room setting." 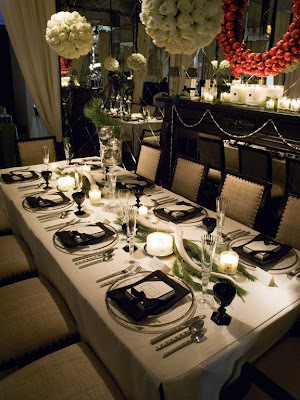 While you may not have the budget to do a professional table setting like this one, there are inexpensive ways to achieve a sensational table at home. Use ribbon to personalize table linens, print custom menus and place cards to make guests feel special, upgrade your chair cushions with new fabric, and use odds and ends (ornaments, greenery, candles) to make an eye-catching centerpiece. Don't forget to add little touches to the buffet and maybe even spice up your walls with warm, winter-inspired art and decor.